I am one of those people who hates to wear shoes and avoids them at all costs. When I am forced to cover up my beautiful feet, I typically wear sandals or flip flops. I know after a long, cold winter like we just had, my feet are not exactly ready for their summer debut. They are a bit dry and my heels have seen better days, so I needed to give them some TLC. If this sounds like your feet, do not hide them! Follow these steps to get those feet ready to show off! Soak Them: The first thing you need to do is give your feet a nice soak. 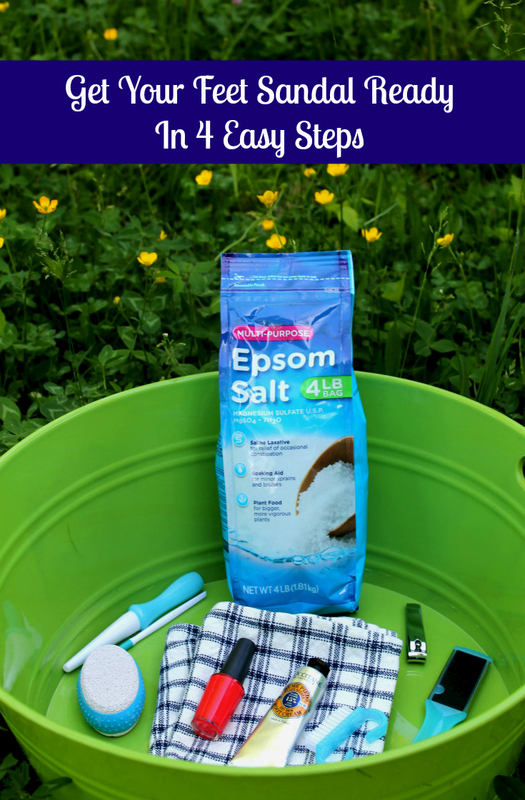 The best way to do this is by adding 1-2 cups of Epsom salt into a warm bath or container. Soak for 15 minutes and pat dry. This will also relieve soreness, swelling and soften dry skin and corns. You should do this several times a week to keep your feet nice and soft and feeling great. Smooth Them: After soaking your feet, they are nice and soft and ready to be smoothed. I use a pumice stone, but you can use other filing and smoothing products made especially for the feet. You should repeat this process each time you soak them. Soften Them: Now that your feet are nice and smooth, you want to keep them that way. Find a good lotion or cream which not only feels good, but smells good as well. I prefer the Shea Butter Foot Cream from L’OCCITANE. I love the delicious scent and my feet feel soft, smooth and refreshed after using it. Treat Your Toes: When you are getting your feet sandal ready, you must remember your toes. Once they are soft from soaking is the best time to work on them. You should clip your toes with the proper tools and do so evenly across. Next you should smooth the edge with a nail file. Next find a pretty and bold color to make your toes pop in those cute summer sandals. If you are looking for a nice gift for mom this Mother’s Day, pamper her with one of the gift sets from L’OCCITANE. The sets contain the bestselling products from the French company, are beautifully packaged and ready to gift to mom on her special day! You can find the sets at L’OCCITANE boutiques nationwide as well as online. In addition to the beautiful sets, you can purchase products from the bath and body, hair, fragrance and skincare. With such delicious collections as the Almond, Cherry Blossom and Lavender, you are sure to find something mom will love. I was sent the Shea Collection, which retails for $78. You can revitalize and hydrate your skin with this nourishing collection of Shea Butter enriched products. It includes the Shea Butter Hand Cream, Shea Butter Foot Cream, Shea Butter Ultra Rich Body Cream, Shea Butter Ultra Rich Shower Cream and Shea Butter Soap. To treat myself to a pre-Mother’s Day relaxation session, I soaked in the tub and used the soap and when I dried off, I used the body cream. Next, I gave myself a pedicure and used the foot cream to get my feet ultra soft and ready to show off in my summer shoes. I love the way Shea Butter leaves my skin, which is soft but not greasy and smelling fresh but not overly perfumed. 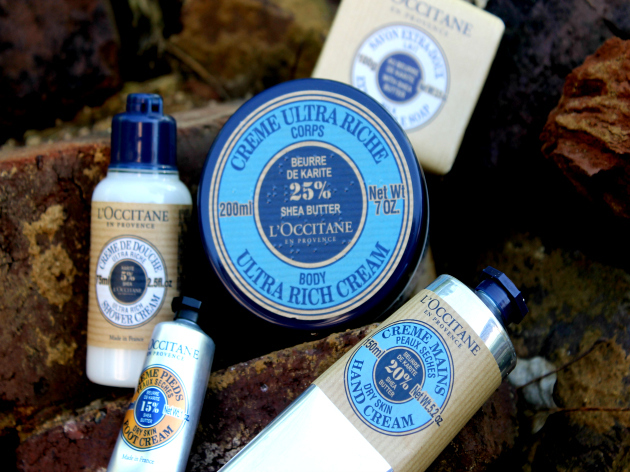 Be sure to follow L’OCCITANE on Twitter, Pinterest and Instagram. How do you get your feet sandal ready for summer?